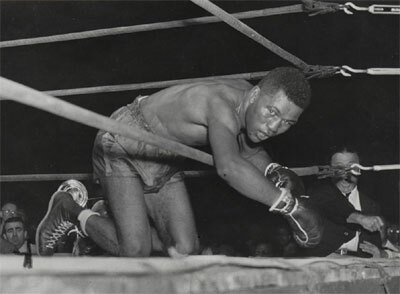 The salt of his blood was sharp in the cuts of his mouth and dreadful doubt was welling in his heart and even beginning to show in his eyes so that all 30,000 present could see when Ike Williams threw in final desperation and certain despair the short right-hand that carried him from a retreating beaten fighter to a magnificent knockout winner over his bitterest foe and greatest rival in the bitter square of the prize ring last night and ended the last claim of Bob Montgomery to the lightweight championship of the world. It was a sharp punch, staccato in nature, straight as the flight of a bullet, and as lethal. Montgomery's face changed with the terrible magic of injury from a fierce menacing scowl to a moronic stare, a vacant blur of flesh, eyes open but unseeing, next sagging under the weight of dulled insentient head, limbs unchanged of all life and action, legs mere unstable rubber. He fell back over the ropes and for a moment they held him but more punches came like the first swift crash of the lightning in a summer storm is followed by the drenching torrent of the heavens, and down he slipped altogether with Charley Daggert, the referee, counting over him. It stunned the crowd that for six rounds had watched the Bobcat fight to a growing advantage even as it stunned the falling champion. Those five rounds that preceded the swift and startling denouncement in the sixth must have taken from Williams the killing power of even his famous and terrific right - the mind almost refused the spectacle, but there it was. Montgomery sprawled out near the ropes and Daggert counted over him until at nine he groped his way to one knee and staggered to his feet. Surely this magnificent fighter of so many grueling battles with his endless endurance, an endurance that had made him as famous as most of them in the long past, could find again the springs of strength that the trained star of the ring knows so well and counts on so surely. But no - he stood there with rubbery legs when he got up and his arms were bereft of even the slight strength needed to lift them before his face and guard against the renewed rushes of Williams, who sprang like a tiger back at his man, lefts and rights alternately smashing into Montgomery's face, unprotected and an easy target, frozen into an awful dumbness, even the sense of fear, even the power to flinch, totally gone. You could hear the smacking of the gloves against the flesh. You could see the blood spurt from the cuts they left in their wake, each a new slash, as though knives and not gloves were breaking up what was left of a once great champion. Down went Montgomery again and this time the tolling arm of Daggert completed its full and final count of 10, although the beaten man managed with a last heroic effort to stagger blindly to his feet again and with instinct rather than reason simply fall toward his blood maddened conqueror. Hate was behind every blow that Williams threw in those tense seconds that wound up a fight which compounded from the deep wells of the past, from incident of slight and injury, from the knocking out of Montgomery's pal (Johnny Hutchinson), from a turned down handshake, from a merciless beating and knockout Montgomery had delivered to this same Williams back four years ago. Hate powered every blow and motored every charge of the two from the first round on when Montgomery started that terrible body beating which time and again bent Williams almost double and slowly was robbing him of strength and power as it had one night so many years ago. As early as the second round Montgomery raised his punches and ripped open Williams' left eye until the blood swan down his face. On the other hand, Williams' blows bent like rays of refracted light off Montgomery's low head and the Bobcat's jaw was ever hidden by his hunched shoulder. Close and hard they fought for round after round, Williams taking the first, Montgomery the second, third and fourth, with the fifth even. Apparently, Montgomery had found that fountain of youth that all men search for with such ridiculous hopes, and the four years difference between the two was as nothing in those early heats. Apparently, Montgomery had discarded the grueling, punishing years as a man discards a well-worn coat. But the everlasting values of life that show up so emphatically and with such exaggeration in the prize ring of all places finally exercised their cosmic authority and destiny followed its usual pattern, although men there are who claim there is no plan and pattern to the fate and its paths. So now Williams is the NBA champion and the Pennsylvania and New York champion again and 30,000 of low and high degree, from governors to hot dog vendors, from society to the unwashed, from important to servile, saw the deed done under the moon above the stadium, a placid moon quite unperturbed in its lunar beauty and calmness by the hates and fighting of mere men below. It was dramatic, it was astounding, it was perfect in plot and fascinating in execution, a masterpiece of man's arrangement, a commentary on the thoroughness of his planned excitements. The king is dead - long live the king.